This short film from the Champion studio in Fort Lee, New Jersey, was screened at the Cinecon film festival this year, so I was able to see it only once. It takes a sympathetic approach to Native American issues and even violates later standards about portraying inter-racial relationships. The movie begins by telling us through forward-facing Intertitles that the “young chief” is being sent to Washington (D.C.) to plead the case of the tribe to congress. Each scene in the movie consists of a single shot, and each shot is preceded by an Intertitle which predicts all of the action that follows. A group of Senators and lobbyists plot against the Indians, to pass a “land grab” bill, and one Senator asks his daughter to “distract” the chief while he is in town, and she does her best to attract his eye. He gives a speech before a group of white men in chambers, however when it comes time to give the critical speech before the vote, she insists that he dance with her at a ball. He rushes in too late to speak before the vote and accuses the Senator of “theft and prostitution.” When he returns to his tribe, they strip him of his war bonnet and prepare to kill him with tomahawks, but at the last moment the daughter emerges from the forest with a letter from the President, promising to let them keep their land “for all eternity.” The daughter now tells the chief that she loves him and wishes to stay with his people. They kiss. This rare film is not available on the Internet at this time. Please let me know if you see it online or in a home video format. This, I believe, is the first movie I’ve reviewed by James Young Deer, a Native American director who mostly made movies about Native Americans for white audiences (at white-owned film studios). This is a short movie, based on the themes of “The Squaw Man,” but told from the Indian girl’s perspective, utilizing fairly basic editing techniques and a central chase sequence to heighten tension. The movie begins with a white settler receiving a telegram informing him of his inheritance. He has to go to some unspecified place to receive it (the ancestral home, I suppose), but he’s very happy to hear it and runs home to tell his family. Said family consists of a small child and a Native wife. When he tells them of his good fortune, the child seems happy for her father, but the wife looks uncertain. Finally, when he gestures about his coming departure, she objects. They argue, apparently the wife is concerned that he plans to go for good, abandoning her (and the child? It’s never clear what her intended fate is). No matter how he tries to reassure her, she will not be consoled. Finally, the father sends the child away, not wanting her to hear the dispute, which escalates until the father goes into the house to pack his belongings. He has left his knife on the table, however, and his wife grabs it and plunges it into her heart. He comes out and finds her, pulling out the knife just as the child returns, making him look like the murderer! 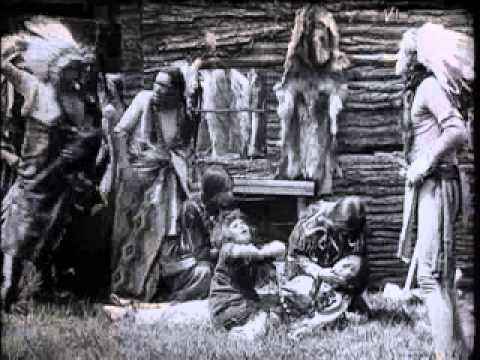 In a panic, the child runs to the neighboring Indian tribe and speaks to a Native elder. When he hears her story, he demands justice for the wife, and sends out the warriors to hunt the white man down. He figures out what is happening and runs for it, grabbing a horse and making tracks as fast as possible. Unfortunately, he is cornered at a cliff and has to climb down, leaving the horse behind. He winds up in the river, fighting the current and losing, ending up passed out on the shore. His pursuer finds him, binds him, and returns him to the tribe, where the elder tells the daughter to kill him, giving her a large dagger. She balks, and the warriors begin a dance. Just as it seems that the elder will take his tomahawk and do the deed himself, White Fawn suddenly arrives, apparently uninjured, and interposes herself. She, evidently, explains the situation and the white man is freed. The family gathers together and the elder signals them to leave. According to the notes that came with the DVD, there’s a missing scene at the end where the father renounces his inheritance and stays with his family, making this the one version of “The Squaw Man” with a truly happy ending. I guess. It seemed to me as if he could go attend the will reading or whatever and then get his money and come back to the homestead easily enough. This version didn’t make it clear what all the fuss was about. In “The Squaw Man” it’s made very obvious that his marrying a non-white is unacceptable, and there’s even some question as to the child. Apparently, Young Deer later made a gender-reversed version in which a white woman was married to a Native American, which Moving Picture World found “disgusting.” There’s also some dispute about the female lead: the “Treasures” disc and the imdb attribute Lilian St. Cyr (aka “Princess Red Wing”) as the actress, but Wikipedia says it doesn’t look like her. I’m inclined to agree, but it’s hard to tell from the distance of the shots and the quality of the available prints (and my own uncertainty regarding the still images Ive seen of her). In this movie, the focus is really on the chase, which is handled competently, but not especially innovatively. Action tends to cut from the pursued back to the pursuer just as the latter reaches the place the former just left. There’s a bit of more sophisticated inter-cutting for the scene at the cliff, where the warrior cuts the rope that the white man is climbing down on, but it’s pretty standard for 1910. There are no close-ups or camera movement, and pretty much the whole movie is done in wide shot. Young Deer made this fairly early in his contract with Pathé Freres, which hired him because American critics were making fun of their phony Westerns, and it was felt that he would bring added authenticity to the new American unit. Marc McDermott chews the scenery as Ebenezer Scrooge, a tight-fisted miser without a friend in the world. We see him berate Bob Cratchit (played by Charles Ogle) at his office before he rudely receives and then turns out petitioners from a charitable society and his own nephew. He yells at Cratchit for leaving early on Christmas Eve, then goes home himself. 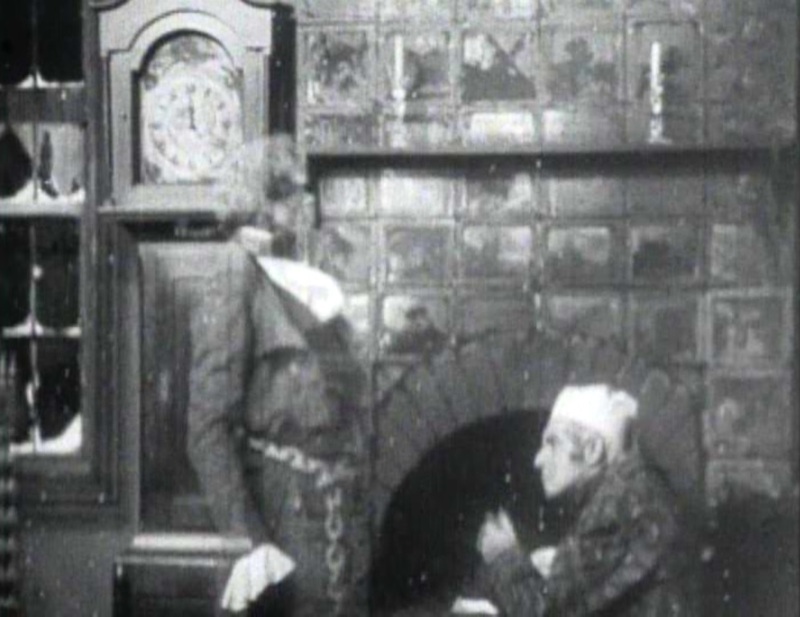 He is confronted by the transparent face of the deceased Jacob Marley on his door knocker. Then, as he prepares for bed Marley comes to warn him that he needs to change his ways or be condemned, as he is. The “Spirit of Christmas” (singular) shows him images of his past, present, and likely future. The images of the past are quite detailed and show a young Scrooge in happier times, the present is limited to images of Cratchit’s family and his nephew’s party, and the future shows him a tombstone which reads: “Ebenezer Scrooge, He Lived and Died Without a Friend.” Scrooge awakes the next morning to children caroling at his doorstep and throws money at them. He meets the charitable society people and hands them bills. He goes to find his nephew and makes him his business partner. And he brings him and his fiancé over to Bob Cratchit’s, where he pretends to be furious, then surprises the family with a huge goose. Scrooge and nephew are invited to dinner and everyone is happy. Like many movies of this period, the success of this one largely depends upon one’s familiarity with the story. Fortunately this story is as familiar today (especially after its many screen versions) as it was then. I thought McDermott did a great job of conveying the necessary emotions: meanness at the beginning, then fear and remorse, followed by the jolly pranksterism of his reformed self. We never got to hear, or read in Intertitles, his famous “Bah, humbug” line, but he makes up for it by curtly dismissing his visitors with a bow. At times, it looks like he might hit poor Cratchit with his cane, he’s so furious about him leaving early on Christmas Eve. We do see Tiny Tim, but only briefly. We see him limping with a crutch, but there isn’t much emphasis on him as a point of interest for Scrooge or Cratchit. We only get one ghost, but at least all aspects of the story are retained in the short run time. 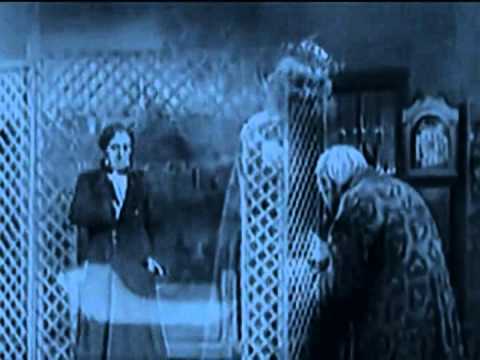 The ghostly effects are probably the part of this movie that interest most viewers today (and possibly at the time as well). They are accomplished through multiple-exposure, and required fairly precise editing and staging techniques to work. 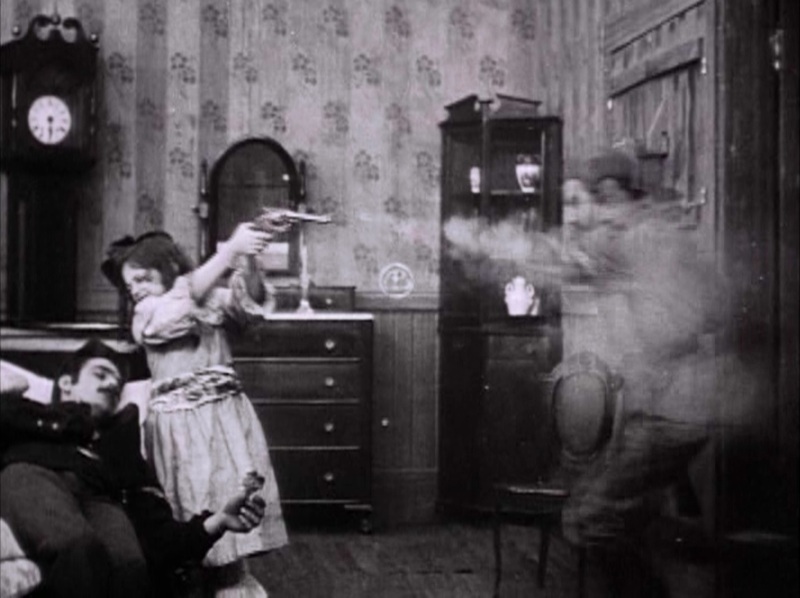 Still, for 1910 they are hardly innovative; Georges Méliès had done for more complex multiple exposures well before this. They do work well enough for the story, however. The other question they raise is whether I should count this as part of my history of horror, always a tricky question in terms of this story, which is both warm hearted and filled with horrific imagery. Because fright plays such a major role in the story arc (it’s the whole reason for Scrooge’s change), I’m labeling it as such. No, this is not a movie about a man on the run seeking a one-armed assassin. 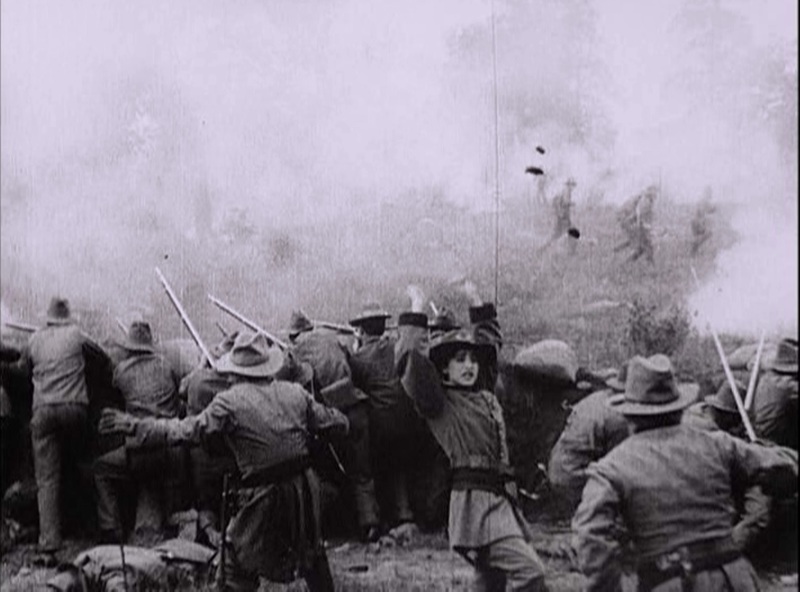 Instead, it is another of D.W. Griffith’s pre-“Birth of a Nation” explorations of the Civil War. 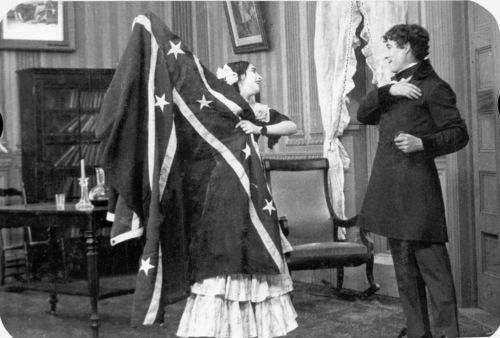 This time, we start with not one, but two tearful farewells, as a Confederate (Edward Dillon, also in “What Shall We Do with Our Old” and “In the Border States”) and a Union soldier (Edwin August, who appears in “The House with Closed Shutters” and “The Eternal Mother”) depart for the front in one of many examples of parallelism the movie provides. In a typical coincidence, they both get separated from their units and the Yankee kills the Reb, only to find himself on the run when his fallen foe’s enemies find the body. Stretching that coincidence even further, now the survivor seeks shelter in his enemy’s home from his victim’s mother (Kate Bruce, also seen in “The Red Man’s View” and “The Unchanging Sea”)! She nearly turns him in, but “thinks of another mother, awaiting her son’s return and does the decent thing. Dorothy West (who starred in last night’s “The House with Closed Shutters”) is the fiancé who loses her beau, and her while exuberance worked on the battlefield, it seems out of place in a bereaved lover. This movie was shot on a limited number of sets in New Jersey in the winter, and that may have limited the use of outdoor setups. There are some nice panoramas, I assume of the Hudson River area, but the porches of the two homes appear to simply be the same set shot from the opposite angle. The editing is less taut than we saw in “The House” or than would be the case in other Griffith shorts. Overall, it seems that the story suffers from a rather conventional approach, and there isn’t much here to pull it out of its banality. One historical footnote is that the original story was written about the fighting in Ireland, and that the writer himself died in 1916 during the Rising there, fighting for the Green side against the Orange. For my money, D.W. Griffith was always better at directing shorts than he was at working in the feature-length. One only has to compare this homely and touching Civil War story to the bloated and un-subtle “Birth of a Nation” for proof. Shot in Griffith’s second year working as a director at Biograph, it has all the humanity and innovation which his best work shows, even if it is at bottom a melodrama. A young father (Charles West, whose work I’ve discussed in “Enoch Arden” and “The Burglar’s Dilemma”) in a state on the border marches off to fight for the Union, leaving his family in peril as the war comes dangerously close. 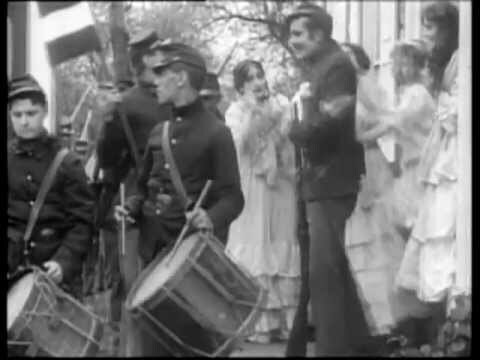 A band of disheveled Rebels “forages” near to the house, and is chased by Union soldiers. 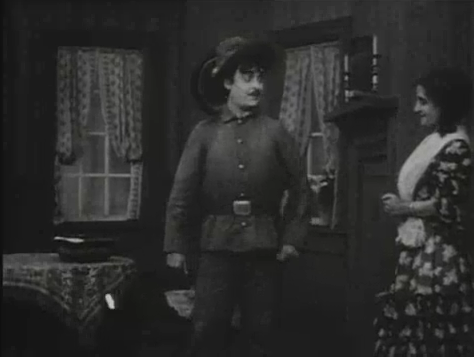 One of their number (Henry B. Walthall, who would later star in “Birth of a Nation” and “The Avenging Conscience”), staggers, desperate, into the family’s land just as the youngest daughter (Gladys Egan, who played the title role in “The Adventures of Dollie” and also appears in “His Trust Fulfilled”) goes out to fetch a pail of water from the well. The man begs for help, and she lets him drink and hide in the well, but refuses him a kiss in thanks. Later, the tables are turned when the father is being hunted, wounded, by this very same band of Confederates, and seeks shelter in his own home. The soldier is about to kill him when the little girl intervenes. He can’t kill the father of the child who saves him, and he convinces, or orders, the others to depart in peace (he’s the only one with Corporal’s stripes, so I guess he’s in charge). The girl and the soldier shake hands and salute one another, and she takes credit for driving the soldiers off single-handed. For 1910, this is quite a sophisticated drama. Much of the movie is shot outside, which prevents the claustrophobia of having too many “square” compositions, as was often the case in studio productions. Billy Bitzer provides good camerawork, including a nice shot of the New Jersery Palisades that passes well for any vista in middle-southern America. Part of the pursuit of the Union soldier is shown as a night shot, by torchlight, apparently achieved by under-exposing the film, but it looks better than a lot of the “night” shots of the time. But the real key to the story is its editing. Griffith deftly cross-cuts between pursuers and pursued in both sequences to heighten tension. For the second sequence, there are two rooms in the house that each character must pass through to reach the ultimate hiding place, and Griffith keeps us aware of the situation in each as the danger develops. Each time we cut back to the wounded soldier, something in the former area has brought peril closer. Walthall’s performance is good, but Egan’s is the best in the movie. I also noticed that it was very easy to read Egan’s lips as she mouths the words “my father” to Walthall in the climactic moment. This was probably intentional, since silent filmmakers encouraged actors to enunciate lines for lip-readers, in lieu of a soundtrack.